Ever thought you did a horrible parking job, but then evaluate and think it's too much trouble to correct it before walking away. Well, some of these people I'm sure regretted that decision pronto, maybe go as far as say an embarrassment? Ha ha I need to do this! Well, one look at this car, and unless you carry a carpet knife in your back pocket, chances are you won't be making it to the ball Cinderella. Maybe next time don't park over the line in your fairy pumpkin on wheels. 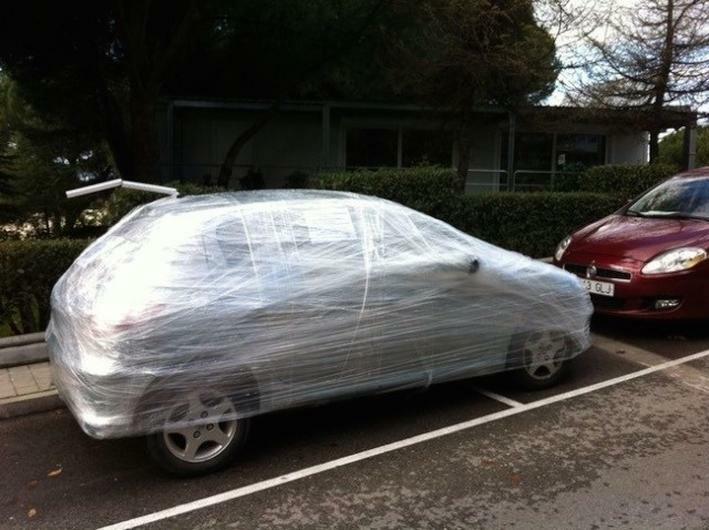 Can you imagine coming out to your car and seeing your car wrapped in saran wrap? I mean, how do you even go about getting this off in a timely fashion? You know you're going to be late for work on this day...but the guy deserves it, look at his parking job, actually, it honestly was a female.